This book is dark, brooding and atmospheric. The author's descriptions are beautiful, yet desolate. I was effortlessly transported to Gruhuken in 1937. The tension is almost unbearable as events surrounding a doomed Arctic expedition unfold. This is one of those books that slowly creeps into your subconscious and before you know it, you're completely immersed. Imagine being the only person on a frozen, inhospitable wasteland. Except you're not alone - there's a malicious entity haunting you. You can't escape. There's no one to turn to. Your sanity is breaking. Can you survive long enough for help to arrive? 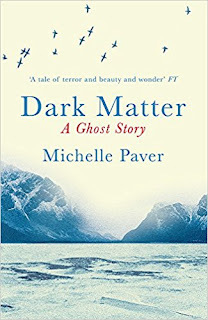 WOW, I really enjoyed Dark Matter; my first book by Michelle Paver. I'm a sucker for a creepy ghost story and this one's up there with the best. Full marks for a fantastically menacing read! January 1937. Clouds of war are gathering over a fogbound London. Twenty-eight year old Jack is poor, lonely and desperate to change his life. So when he's offered the chance to join an Arctic expedition, he jumps at it. Spirits are high as the ship leaves Norway: five men and eight huskies, crossing the Barents Sea by the light of the midnight sun. At last they reach the remote, uninhabited bay where they will camp for the next year. Gruhuken. But the Arctic summer is brief. As night returns to claim the land, Jack feels a creeping unease. One by one, his companions are forced to leave. He faces a stark choice. Stay or go. Soon he will see the last of the sun, as the polar night engulfs the camp in months of darkness. Soon he will reach the point of no return - when the sea will freeze, making escape impossible. Born in Malawi to a Belgian mother and a father who ran the tiny 'Nyasaland Times', Michelle moved to the UK when she was three. She was brought up in Wimbledon and, following a Biochemistry Degree from Oxford University, she became a partner in a big City law firm. She gave up the City to follow her long-held dream of becoming a writer. 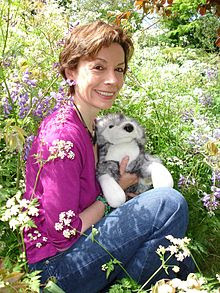 Successfully published as an adult author, the Chronicles of Ancient Darkness ("Wolf Brother") were her first books for younger readers, followed by her brilliant 5-part series set in the bronze age, Gods and Warriors. On the adult side, her first ghost story, DARK MATTER, was a UK bestseller and won massive praise from reviewers and readers.